If you have taken to the New Jersey roadways lately, you have likely witnessed other drivers glancing down at their cell phones – or typing away on them – all while changing lanes, maneuvering in and out of traffic, and otherwise trying to drive. Texting while driving is illegal, it is dangerous, and it is killing an average of 9 people a day in this country. And yet, it has become increasingly common. Cell phone addiction has made the headlines recently, as a growing body of evidence indicates that cell phone and internet addiction is harmful to both body and mind. Surveys conducted by the Pew Research Center last year indicate that more than three quarters of Americans own smartphones. An earlier study by the same organization reported that almost half of adults in the country and nearly one out of three 16- or 17-year olds admit to texting while driving. In the Garden State, it is considered a primary offense for a motorist to use a hand-held wireless telephone or electronic communication device to talk or text message while driving. Handheld devices may only be used in emergency situations and the driver must keep one hand on the steering wheel at all times. In today’s connected society, many of us think we can effectively do several things at once. However, numerous studies show that the human brain does not multitask very effectively. Instead, when given more than one task to accomplish, the brain diverts attention from the first activity so that it can focus attention on the second activity. So if you are driving and then reach for your cell phone to send a text message, you are, in fact, taking attention away from the act of driving. This is distracted driving. And it is dangerous. In fact, distracted driving killed 3,477 people in this country in 2015, according to the National Highway Traffic Safety Administration (NHTSA). An estimated 1,000 people are injured every day in distracted driving-related car accidents. The law protects those who have suffered injury in an accident due to someone else’s negligence — such as texting while driving – by providing monetary compensation for their injuries. Get the compensation you deserve. 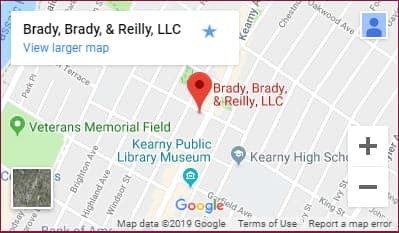 At Brady, Brady & Reilly LLC, our skilled New Jersey personal injury attorneys have represented New Jersey accident victims and families for more than 50 years, successfully securing just compensation for their injuries. Give us a call to discuss your case. Contact our office at 201-997-0300 or contact us online to arrange for a confidential consultation.